On October 6th, 2017, the United States Postal Service (USPS) announced a price increase to take affect January 21st 2018. The new price schedule increases the retail price of first class postage for letters and postcards by 1 cent each. Certified Mail with Electronic Return Receipt will see a 15-cent increase. Keep in mind, the USPS “proposes” their new pricing, but the Postal Regulatory Commission (PRC) must approve the pricing before it can become official. Historically the PRC has denied or adjusted price increases if the USPS attempts to raise prices too high compared with the current consumer price index (CPI). In this case the USPS is only raising rates by 1.9% which is believed to be accepted by the PRC. Below is the primary list of rates that may impact LetterStream customers. Also keep in mind that LetterStream historically does not raise prices on any item beyond the actual USPS price changes. If you are working on a First-Class Mail project for the new year, we’d encourage you to schedule it before the new rates are implemented. Here’s a fun habit we’ve fallen into at the office. 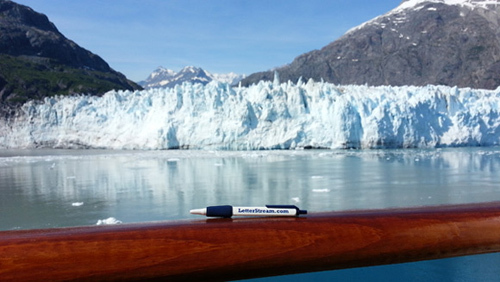 Whenever someone travels to a unique destination, they take a LetterStream pen along for a quick photo to be sent on a postcard. 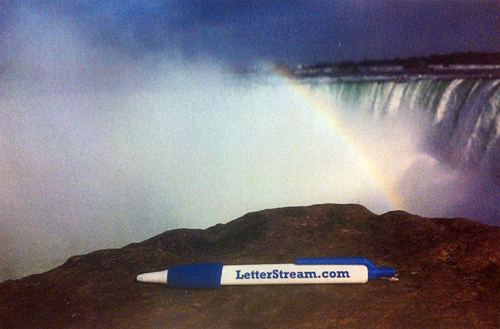 Our collection of postcards grows with pictures of the LetterStream pen at the Grand Canyon, Niagara Falls, Puerto Rico, the Las Vegas strip and more. You can find some of these pictures on our Instagram account. 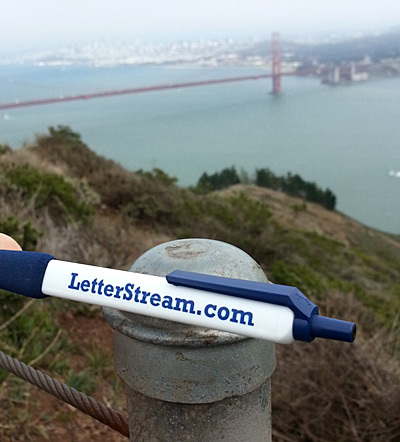 If you want to join the fun and capture pictures of the LetterStream pen in unique locations, simply ask for one next time you’re talking with any of our team members, or pick one up at our booth at the CAI trade show we attend each year. Running a little behind this Holiday? Aren’t we all. But here’s a way to get your Christmas greetings out the door quickly. Granted, we are known for our industrial grade automated mailing solutions, but one of our products makes sending fun, full-color postcards a breeze. All you need is a picture and the addresses of those you want to send the postcard to. Wow, this sure is going to be a short blog post. It’s funny because you could probably create your Christmas postcards in less time than it took me to write this short little post. Want more info? Our postcards are printed in full-color, full-bleed (printing all the way to the edge of the postcard/no white margins). The postcard is 5 1/2″ x 8 5/8″ printed on heavy card stock paper. 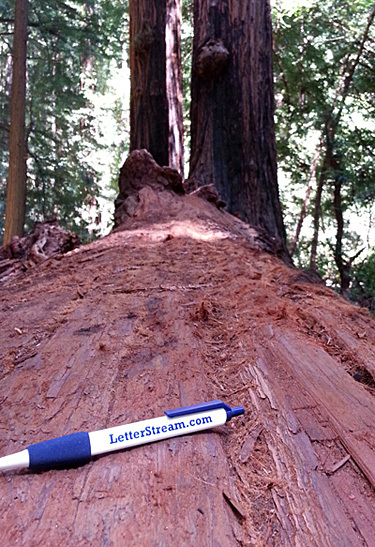 Nearly any size image will work as our cropping tool will help you fit the photo to our postcard. If the image is too small, we will give you a warning, but most pictures from today’s modern smartphones should work just fine. There’s room for another image on the address side of the postcard as well, or you could leave a white space if you aren’t feeling creative or are pressed for time. On the other hand, you can type out some well wishes and save them as a .jpg file. You might even want to put a colorful, festive background behind your holiday greeting to add more color to your message. I recommend making the address-side image roughly square as that is the area available to you. Again, our cropping tool will help you crop the image so that it fits the message area. I guess I should talk briefly about addressing your postcards. You can enter the addresses one at a time into your private online address book (which will make sending next year’s greetings even faster), or you could upload a .csv file to get all your addresses loaded in a snap. Once your job is complete, we take your postcards to the Post Office and mail them via USPS First-Class mail. There’s nothing else you need to do! Ok, we’ve taken enough of your precious holiday time. Get started, find that great holiday photo and your mailing list, and get those postcards in the mail. 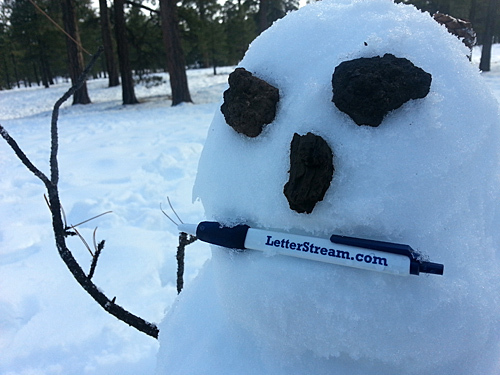 ***For the month of December, all postcards created on our website before noon Arizona time (MST) will mail that same day. What Do VW's And LetterStream Have In Common? Well, VW’s and LetterStream don’t have a lot in common, except for both are sporting the LetterStream logo. It’s the result of a unique “marketing” opportunity that we couldn’t pass up. Chris, who heads up our IT team, is racing a Class 11 VW in the Baja 500 this year and we had the opportunity to donate a few dollars to help his cause and get our name on the side of the car. We are convinced that displaying the LetterStream logo on the side of a dirt covered VW racing through the abandoned deserts of the Baja Peninsula in Mexico will yield thousands of new customers… or not. Today I’m heading out into the local Sonoran desert a few miles north of our offices in Scottsdale to watch them do some test runs and see how the car performs on winding and rocky roads. I figure I’ll take a few pictures of the car with my Andriod phone and send some real USPS postcards to myself while testing out our new postcard-sending app that Chris and his team is working on. What’s cool is that Chris will be able to take photos with his own phone while traveling at high speeds down the Baja Peninsula, and instantly send real paper postcards to his family and friends in the U.S. (who might even receive the postcards before Chris crosses the finish line!). Starting at just $.59 each, printed and mailed, the postcards are an inexpensive way for Chris to keep his family up-to-date on his progress in a fun, keepsake format. We are excited about your adventure, Chris. Make sure you drive slow enough for everyone to see our logo! It’s official. The United States Postal Service (USPS) is increasing postage rates on many of their services, including First-Class postage. The changes are set to take effect on January 27, 2013. Visit LetterStream.com today to create your First-Class mailing before the new postage rates go into effect. We are always available to help walk you through the process–it just takes a few minutes! LetterStream is participating in a local Toys for Tots event this year in North Scottsdale. The event includes food, live music, Marines and the big-guy wearing a red suit. Yes, Santa will even be there and available for pictures. It’s at the Pinnacle Peak General Store and Village, in the courtyard between 11:30 AM and 2:30 PM, Saturday December 15th. It will be a great outing for family and friends. If you join us, be sure and bring a toy or two for the Marines to distribute to children. *Pictures in this post are from the event last year. I was walking through our facility and saw this postcard in our production department. I’m always fascinated by the creativity of our customers and enjoy seeing unique ways to communicate information. This particular postcard jumped out at me as it had our company name on it. 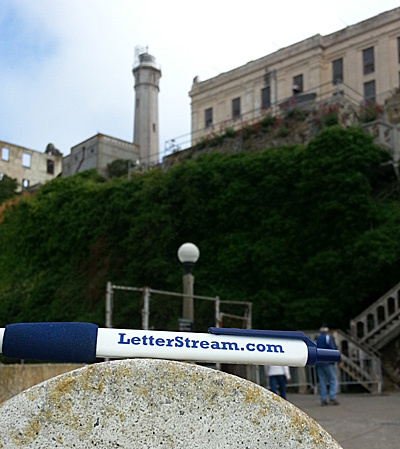 Who’d be sending a postcard with LetterStream printed on the front… other than a LetterStream employee? Turns out one of our vendors bought us lunch (which was greatly appreciated) the same day that our new tech services manager started. Our new manager learned how easy it is to make postcards as well as created a fun and creative way to say “Thank You” at the same time!